Lady Bunny Blog: HERE GOES MY CORNY SIDE! Probably not even a true story, but it hit me at the right moment. So don't bother to send me the Snopes.com link to discredit it! He invited all his neighbors to come over and help him. They all grabbed a shovel and began to shovel dirt into the well. At first, th...e donkey realized what was happening and cried horribly. Then, to everyone's amazement he quieted down. 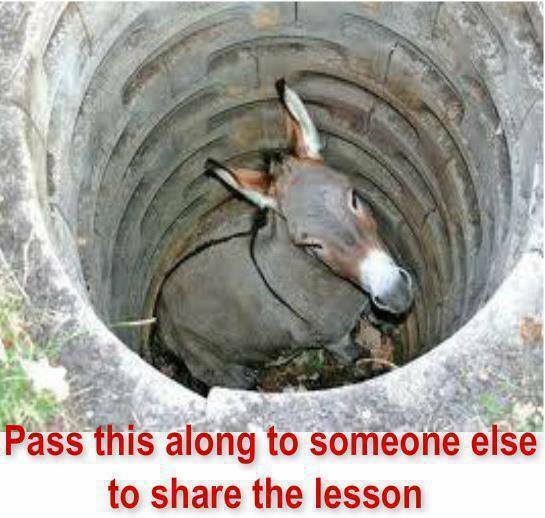 DID I MENTION THAT WHEN THE DONKEY FINALLY CLIMBED HIS WAY OUT OF THE WELL, HE DIED FROM EXHAUSTION?